At the February 5, 2019 City Council meeting, all councilmembers were present except Marvin Heinze. The major topics included new parking for 1000 C Avenue, Caltrans relinquishment, and the 12-month parking permit study. Jessie Brown, Senior Planner, Community Development Department, gave a presentation on the parking plan review for additional parking for 1000 C Avenue. The new one-way parking area would be accessed from C Avenue and would include 29 shared spaces, with 11 designated for valet and five compact spaces. He said, “This plan shows compliance with all the required dimensions, drive aisles and landscape requirements, and furthers the Orange Avenue specific plan by creating a pedestrian paseo and parking lots at the rear of buildings.” Two existing curb cuts would be closed to create two to three additional spaces. Conditions for approval include having the valet parking operational during all restaurant hours, undergrounding utilities, installing a speed bump and stop and pedestrian crossing signs. The Planning Commission vote failed with a two to two vote, due to concern of enforcement of the valet parking, the use and number of compact spaces, and where employees would park. Councilmember Donovan asked whether this parking plan met the owner’s plan for the restaurant. Brown answered that, “No plans for the interior have been submitted to the City. My understanding is that they wanted to see how many parking spaces they could fit and then use that number to design the restaurant space.” Councilmember Donovan asked how the City would enforce the valet parking hours because there have been issues with this in the past with other sites. Many people spoke on this topic including Angelica Muller, owner of Bay Books, who said, “We were ready to close at the end of the month, but we had a lifeline. Leaving Orange Avenue was not an option.” They have been working with Kleege Development and will be moving into the prior Bullshirt location. She continued, “We need the City to grandfather in the coffee cart [Cafe Madrid] and grab-and-go food service to help make this possible.” Bay Books is the largest independent bookstore in San Diego’s south county. 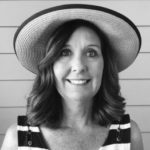 Rita Sarich said that Coronado MainStreet supports valet parking and believes it can be an important tool to use in a crowded downtown, but is concerned about who will monitor the valet parking. She also pointed out several valet attempts that have failed, with the exception of the hospital which has been successful. Phil Monroe asked why these spaces aren’t designated for the restaurant. He also questioned the validity of allowing compact spaces, when so many people have large cars. He also wonders about the enforcement. He formally submitted his concerns in writing to the City Council. Carolyn Rogerson concurred with Sarich and Monroe’s comments. She pointed out that LAZ Parking has high prices and charges based on the affluence of the area, and was part of a recent experiment with the Bank of America building. She’d like to see two-hour free parking with validation and have it open 24 hours. Mike Mosier, a longtime resident, said he is working with Kleege Enterprises on the leasing of this block. He said that Bruce Kleege has a home here and he said, “This project is not about money. It’s about doing something that’s right for the community, it’s about upgrading the block and bringing the right mix of tenants that are going to be beneficial for all of us who live here. We’ve signed four to five leases that are best in class. 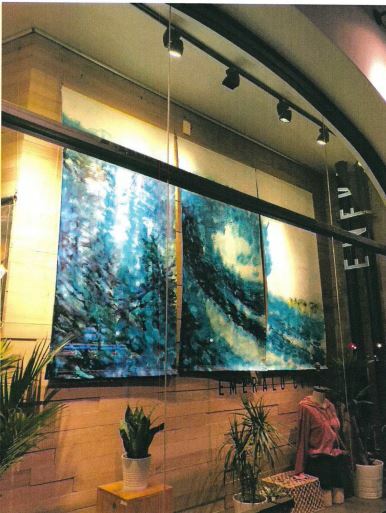 All have ties with the local community.” He said they just leased the former Eagle building to a real estate company. “I strongly urge you to support this project,” he concluded. The mayor and all the city council members indicated that they have all met with Kleege Enterprises and have received communication from residents. The mayor stated, “This is obviously an important block. There’s a lot of history wrapped up in it. It’s fair to question the efficacy of valet parking operations, but what’s before us now is ‘does this proposal meet our legal parking requirements?’” Councilmember Sandke said that this has been an emotional issue and asked for designated bike parking. He added, “This is a herculean project that they have made it work with the space constraints.” Councilmember Benzian said, “I’m very comfortable with this plan and I’m a big believer in the biking and walking movement.” The Council agreed that the parking requirements have been met with this plan and unanimously voted to approve it. Caltrans proposes to relinquish ownership of State Route 75, from 0.2 miles north of Rainbow Drive in Imperial Beach to Glorietta Blvd, and the entire State Route 282 within Coronado’s City limits. Relinquishment is proposed in “as-is” condition with no construction improvements. Coronado can accept the relinquishment in three phases: Silver Strand segment (City limits to Tulagi Road) for $3.45 million; Orange Avenue segment (Tulagi Road to Toll Plaza) for $9.1 million; and thirdly the 282 segment (Third/Fourth Streets, Alameda Blvd between Third and Fourth) for $4 million. King said that the City recommended hiring Fermanian Business & Economic Institute (FBEI) at Point Loma Nazarene University (PLNU) to conduct an economic analysis of the benefits versus detriments of ownership of State Routes (SR) 75 and 282 and to authorize the Public Services and Engineering Department to initiate a Request for Proposals (RFP) for engineering and traffic consultants to conduct peer review of the relinquishment report. The proposed schedule includes information gathering and analysis through August 2019. The next step would be consultation and negotiation with Caltrans, which would be done fourth quarter 2019 to first quarter 2020, after which a final decision to accept or decline ownership would be made in the first or second quarter of 2020, with a State Legislative Action to follow. The Council unanimously voted to enter into this agreement to further study this issue. Tom Ritter, Assistant City Manager, gave a presentation on the 12-month Parking Permit Survey results. The program began back in October 2017, when the city council directed the suspension of the Parking Permit Zone signs for 12-months, with the signs being removed the next month. In March 2018, the council received an update and continued the program. 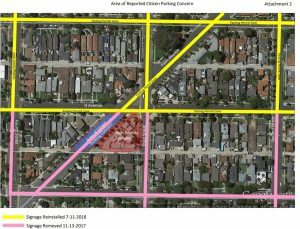 After another update in June 2018, the council directed the reinstallation of permit parking signs on Alameda, J, I, and H Streets only. The surveys continued on both sides of the streets for the zone through December 2018. Zoned decal parking permit map. 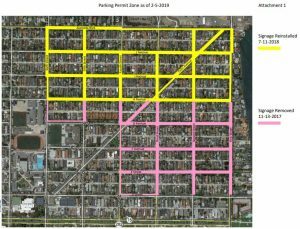 After much discussion, the council voted to accept the Parking Permit Survey results as they are currently, with the addition of Palm Avenue between 3rd and 4th to permit area, and to also remove the poles in the suspended areas. The council approved a two-lot tentative parcel map for 634 Pomona Avenue, so the land can be split with one residence on Pomona Avenue and the other on Adella Lane. There were six speakers during Oral Communication on a variety of topics. First up, Daron Case presented that he had recently formed the Coronado Citizens’ Coalition and has circulated several petitions in the past several weeks, including one to receive Nixle alerts for beach closures and another to ask the City of Coronado to reconsider joining the sewage lawsuit. He also sent a petition to the council with regards to safety at the entrance of the Cays. A local father, Ken, brought up the lock-down and fire alarm situation at the school this week. The Mayor indicated that he could leave questions with the City Clerk and they would get back to him. Later in the meeting, City Manager Blair King addressed this issue saying that the Police Department didn’t request the lockdown, but arrested a student at their home. He stressed that it is important to get pertinent information from CUSD rather than social media. The fire alarm was a separate incident and was handled by the Fire Department. Javier Gomez, Field Representative, from Assemblymember Todd Gloria’s office said he is looking forward to working with newly sworn in Governor Newsom. Gloria was renamed Majority Whip of the California State Assembly and appointed Vice Chair of the LGBT Caucus. He noted that the Hepatitis A audit was completed in late December and found multiple issues with city and counties response and so they introduced AB 262, a bill which establishes specific roles and responsibilities of local governments for an outbreak of communicable diseases. He also presented highlights from the new budget with $158.6 billion designated for health and human services programs, and $12.6 billion for public safety. He pointed out that there are 134,278 homeless people in California, making it 25 percent of the national total, so $500 million in one-time funds will be designated for emergency and supportive housing needs. For transportation needs, SB 1 funds will see $1.2 billion for cities and counties for road repairs and an equal amount for state road repairs. For the second year, $48 million has been designated for free tuition for community colleges. Gabriela Torres, Policy Coordinator, Surfrider Foundation, asked for support and comments for the Stakeholders Solution for infrastructure of green policies and programs to reduce sediments, pollution and sewage. David Rolland, Media Director, Senator Toni Atkin’s office, talked about how the budget aligns with her priorities including fiscal responsibility adding $1.8 billion to the rainy day fund bringing the total to $15.3 billion to guard against the next economic downturn. Monies will be reinvested in state level earned income tax credit, which will double its budget. $4.4 billion is designated to pay down past debts, and $5.3 billion to pay down unfunded employee pension liabilities. The new budget also seeks to expand healthcare coverage for all Californians. Funding for schools, fire prevention, and many other programs are also included. Carolyn Rogerson brought up her concerns over the safety issues regarding Lime and Bird scooters not requiring helmets, which she pointed out is extremely dangerous to the riders and other vehicles on the roads. The following Transportation Commission appointments were made: Howard Somers to serve a second, three-year term expiring on February 28. 2022; Alexander Jackson to serve the remainder of a term, which expires February 29, 2020; and Jason Paguio to serve a three-year term expiring on February 28, 2022.